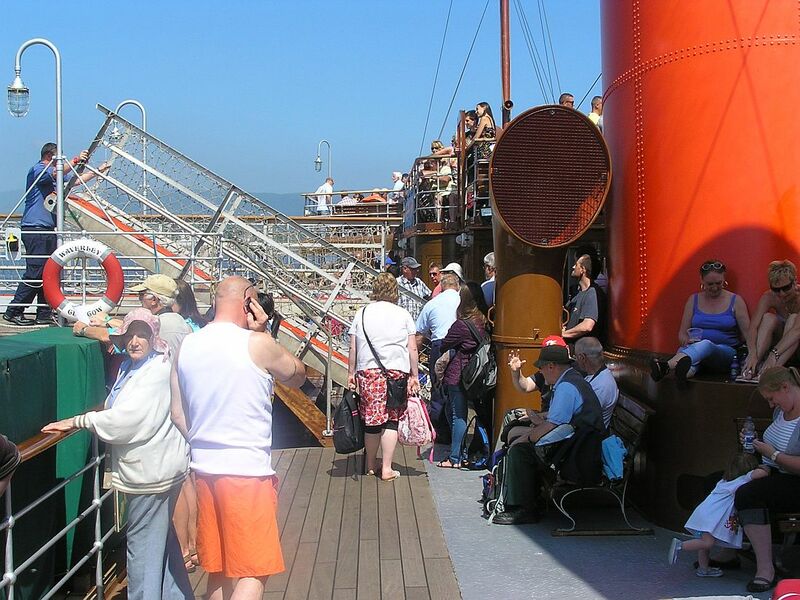 Passengers join Waverley by gangways on to the promenade deck, where there are fore and aft shelters. The aft shelter houses a small tea and coffee servery and the purser's office is nearby. Above the aft deck shelter is the observation deck, accessed by a stairway behind the deck shelter. The bridge,which includes the wheelhouse and the captain's accommodation behind, is above the forward saloon and is restricted to crew access only. There are stairs (companionways) down to the main deck level from both deck shelters. On the main deck there is a bar forward and a restaurant aft. Amidships is the boiler room and the engine room, The latter is open for the public to see the magnificent steam engines in action. In the spaces close to the paddles can be found male and fremale toilets. The Souvenir Shop is a kiosk close to the entrance to the restaurant aft. 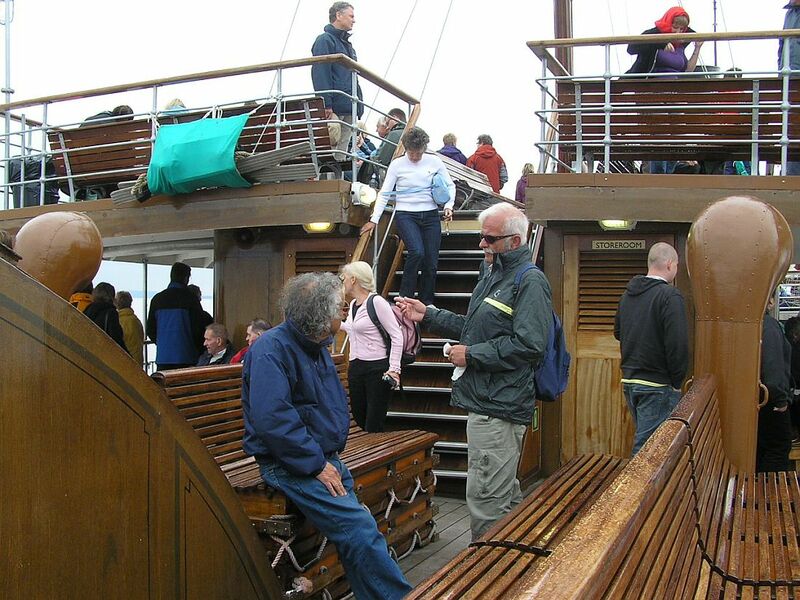 On the port side of the entrance are stairs to a second bar on the lower deck. other spaces are given over to crew accommodation and storage. Now go for a photographic tour of the ship. Gangways are normally placed on the sponson above the paddle box, but depending on the state of the tide, access may be directly from the promenade deck. Passengers will join the ship amidships, near the funnels. The brown vertical stack with grille is one of the many air intakes to allow cooling air to get to the main deck. A favoured place for some to sit is by the aft funnel casing which houses the exhaust from the boiler below and can provide welcome warmth on a chilly day.